Every kid knows that there are more places to get toys than just the local toy shop. Hobby shops sometimes stocked a few trinkets that didn't try a kid's patience with all that gluing and painting. Then there's the grocery store. I know that grocery stores now sometimes even have a whole aisle devoted to toys, but in the local mom & pop stores I grew up with you were either confined to what was in the gum ball machine, or what you could find randomly hanging from pegs while racing up and down the aisles of the store. 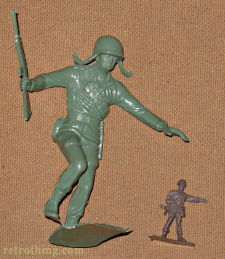 Green plastic army men were a perennial, not only dangling from grocery store shelves, but they were also available via mail order from the backs of comic books. Is there a boy alive who didn't marvel at the garish full-color offers of 1000 plastic soldiers delivered in a real (cardboard) footlocker? Model soldiers were always a hobby shop staple, but they were often quite costly and required careful and time-consuming painting. 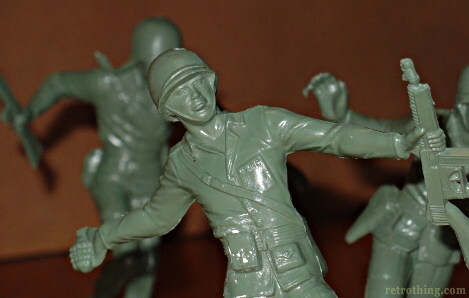 I had a handful of army men, and they were tremendous fun right out of the bag. There were always enough that I didn't have to worry too much about losing men in backyard skirmishes. No stickers to come off in water, no moving parts to get clogged with sand at the beach. For the price of a candy bar, you could have dozens of troops to deploy at your next family outing. I imagine that it's their disposable and cheap nature that has kept army men around in toy and grocery aisles for more than half a century. They were originally introduced in the 1950's by Marx, a prolific toy company with many varieties of solid-bodied immobile plastic figures. Their design has remained largely unchanged in all that time, with many bootlegged toys swelling ranks cheaply nationwide. 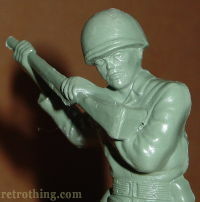 Ask any guy whether they can remember the “cardinal” green army guy positions, and they will list off several. Here are the ones I remember; crawling guy, loading a mortar guy, throwing a grenade guy, minesweeper guy, bazooka guy. I guess that's what a limited product line built on repetition will do to young boy's minds. 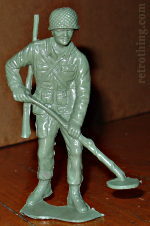 These particular army men are much larger than the usual 2” figures. I didn't know about these large scale soldiers until my best friend in college talked about melting and blowing up his troops with firecrackers in his youth. I then learned that this was practically a rite of passage among boys – one I'd missed out on (where in the heck did these malcontents get firecrackers at age 8?). 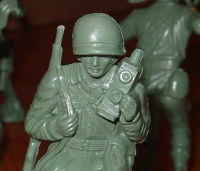 Clearly his town's grocery store was prepping to take over mine with their giant 5” army guys. I got these big guys at a thrift store recently. While the level of detail in such cheap toys is interesting (note that their helmets are the same style as the little 2” guys from the 1950's), they are shoddily made, brittle, and have tons of flash and molding errors. Could any kid possibly care? The tatty troops will still turn into polystyrene green puddles under a magnifying glass or blow up into a million pieces. So where can I get a couple of M80's in December? Whoa - a thousand army men for twenty bucks! Marx toy soldiers on the march!